WIN A SPEYSIDE SESSIONS CD SIGNED BY KEVIN! Our favorite charity album recently turned 1-year-old. To honor this milestone and special occasion, Kevin McKidd Online is holding a TRIVIA CHALLENGE. 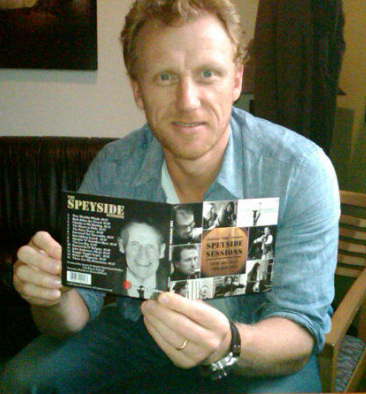 As a prize, one lucky fan will receive a copy of THE SPEYSIDE SESSIONS music CD autographed by Kevin McKidd! View the Speyside Sessions Trivia Challenge crossword puzzle ONLINE or as a printable PDF. Highlight the question clues (ACROSS + DOWN lists) and COPY/PASTE them into an email with your ANSWER beside each question. Email your entry to KMKcharity@yahoogroups.com with “SPEYSIDE TRIVIA” as the subject line. HURRY! Contest ends July 15, 2013. Show your spirit for the Sessions and prove to everyone that you are a Speyside Diehard! NOTE: You can play the puzzle online (it’s simple!) or print the PDF, but to enter the contest you MUST EMAIL your answers to KMKO. A list of all puzzle questions can also be downloaded as a simple TEXT FILE. The answer key to the puzzle will be published after the contest ends.